On September 11, 2001 my husband was playing music professionally and was 2 semesters away from a degree in music education. That’s a nice, safe, sturdy profession. After a semester of student teaching, he knew it wasn’t for him. I don’t even remember now how it is that Ryan became a firefighter. It might have been 9/11, I don’t know. I do know that he’s a great firefighter and it’s been a job that he’s loved. 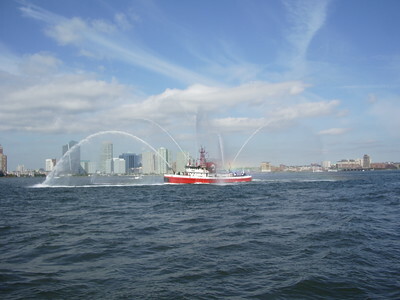 One thing that comes with him being a firefighter is a feeling that he’s part of something bigger. 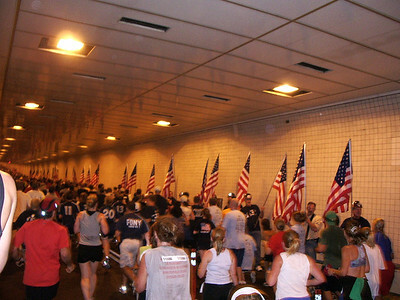 I didn’t really understand that until we went for our first Tunnel to Towers run in NYC. 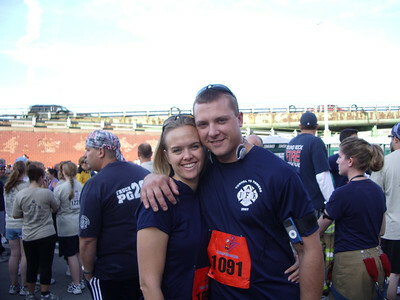 The run follows the path of Stephen Siller, a firefighter who had just gotten off shift the morning of 9/11. 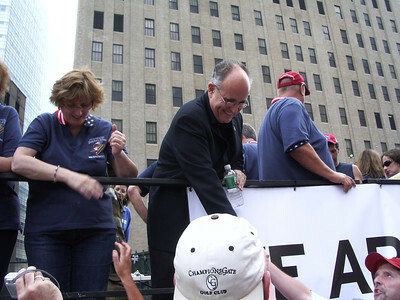 When he heard that a plane hit the WTC, he called his wife to tell her he’d be late because he was going in to try to help. He tried to get into Manhattan but the tunnels where already closed. He grabbed his 60 lbs of gear and he ran through the Battery tunnel and all the way to Ground Zero. He died that day with 342 of his brothers. 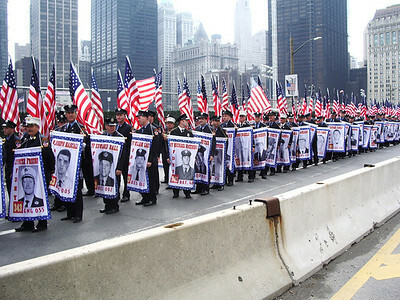 These are NY firefighters who are each holding a banner for a firefighter who died on 9/11. You get a second wind. Then you hear the bagpipes at the other end of the tunnel. 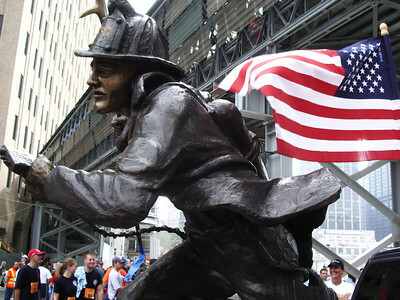 If that all weren’t enough, some NY firefighters see you, ask you where you’re from, thank you emotionally for coming, and then they invite you to ‘a bar’. 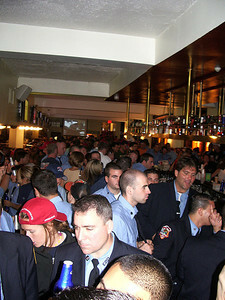 You follow them through the quiet streets of downtown, into an alley, and you walk into a firefighter-themed bar that is packed with firefighters from around the world. You don’t buy a single drink for yourself because the NY guys insist. At some point the bagpipes come in and the bar goes crazy. You stay for hours, you trade shirts with firefighters from London, you make plans to keep in touch with firefighters from Seattle. I feel lucky that Ryan’s a part of something bigger than himself. And please, what girl doesn’t dream about being one of only a few girls in a bar full of men in uniform? I’m lucky by association. 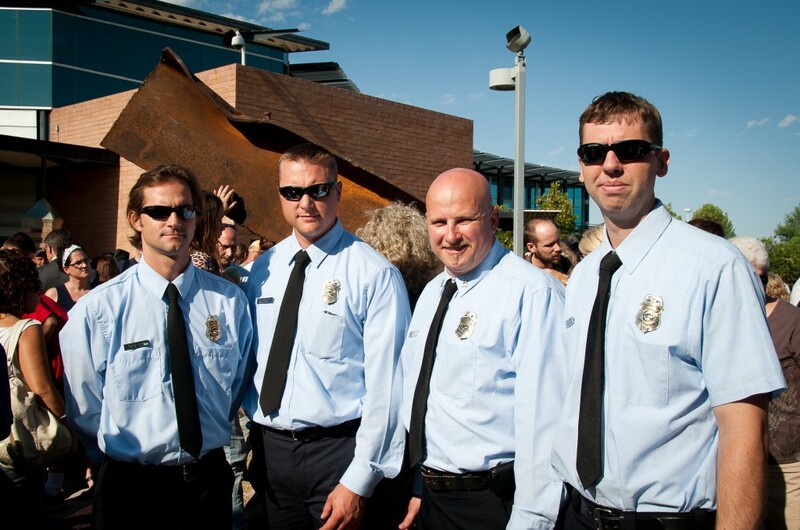 Yesterday morning Ryan’s crew attended the opening of a new 9/11 Memorial in Gilbert. Behind them in this picture is a beam from the WTC. 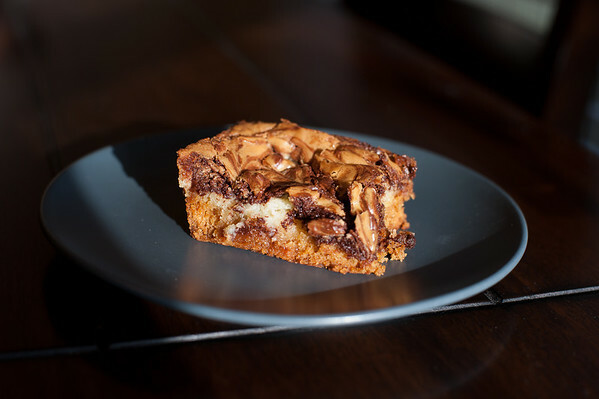 For Ryan’s guys yesterday I made them these insanely evil bars from The Cake Mix Doctor. It’s one of my favorite cookbooks. 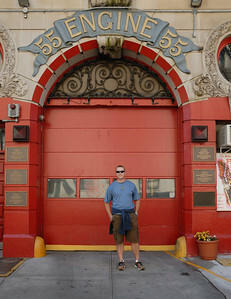 And just so you know… If you ever want a tour of a fire station, just show up with baked goods. I wasn’t the only one with this idea yesterday, the guys had visits from two families with treats that gave mine a run for their money. That said, this recipe is a winner. 5 out of 5! The Cake Mix Doctor does it again! I haven’t baked a bad recipe from this book. Preheat the oven to 350 degrees. Set aside an ungreased 13×9 inch baking pan. For the crust, place the cake mix, melted butter and egg in a large mixing bowl. Blend with an electric mixer on low speed for 2 minutes. Stop the machine and scrape down the sides of the bowl with a rubber spatula. The batter should come together in a ball. With your finger-tips, pat the batter evenly over the bottom of the pan, smoothing it out with your fingers until the top is smooth. Set the pan aside. For the filling, place the cream cheese in the same mixing bowl that was used to make the crust, and with the same beaters (no need to clean either) blend with an electric mixer on low speed until fluffy, 30 seconds. Stop the machine and add the eggs, vanilla, and melted butter and beat on medium speed for 1 minute. Stop the machine and add the confectioners’ sugar. Beat on medium speed until the sugar is well incorporated, 1 minute more. Stop the machine and scrape down the sides of the bowl with a rubber spatula. Place the chocolate chips in a small saucepan over low heat. Cook, stirring, until the chips are melted, 1 to 2 minutes. Don’t burn! Measure out 1 cup of the cream cheese filling and fold it into the chocolate mixture, stirring so the batter becomes well combined and all one color. Set aside. Pour the remaining filling onto the crust and spread with the rubber spatula so that the filling covers the entire surface and reaches the sides of the pan. Drop spoonfuls of the chocolate batter over the top of the filling, then swirl them with a dinner knife so the top of the batter has a marbled effect. Be careful not to cut through the crust. Place the pan in the oven. Bake the cake until it is well browned but the center still jiggles when you shake the pan, 45 to 47 minutes. Remove the pan from the oven and place it on a wire rack to cool, 30 minutes. Cut into squares and serve. Store this cake, covered in foil, at room temperature for up to 4 days or in the refrigerator up to 1 week. Or freeze it, wrapped in foil, for up to 6 months. Thaw the cake overnight in the refrigerator. This entry was posted in 5 Wine Glasses, Dessert and tagged cake, chocolate. Bookmark the permalink.